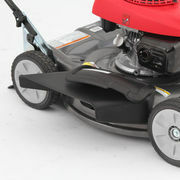 The HRS216 Utility lawnmower is built to handle any domestic setting. Featuring a durable 21 inch steel cutting deck which is strong enough to deal with anything your may find in your backyard. 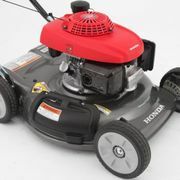 This lightweight mower, accompanied by the ball-bearing rear wheels will ensure that you can manoeuvre your Honda HRS216 around your backyard with ease. Honda's technology innovation is always ensuring safety is a key feature of their products and the HRS216 is no exception. Honda's engine brake technology ensures the engine and rotating blades stop within three seconds of releasing the handle. The side chute design of the HRS216 enables the grass to be returned to the lawn ensuring the soil is kept moist and full of nutrients so that your grass is green all year long. The side chute and mulching ability removes the need for a catcher bag and allows you to mow you lawn without having to empty the grass clippings from a catcher. 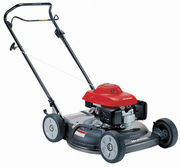 The HRS216 is ran by the powerful and fuel efficient Honda four stroke GCV160 overhead cam engine. 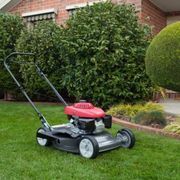 This premium engine is the lightest one available in the residential class running on regular unleaded petrol ensuring your mower is ready to go every day of the year. The highly generous 21" cutting width will ensure that you spend less time mixing your lawns and more time doing the things you love. 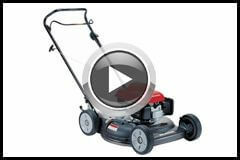 This safety features ensures that the mowers engine and blades stop within three seconds of releasing the handle. Reducing the risk of injury associated with using mowers. The Honda HRS216 is a utility mower boasting the ability to side discharge your lawn, meaning no trips to empty that catcher. Alternatively you can mulch your lawn so that your clippings are finer and hidden in the existing grass rather than the larger clippings side thrown by the mower.